Deputy U.S. Marshal Casey Sloane has worked at the St. Louis Marshals office for two years and is given a routine assignment to help transport a reporter to D.C. to testify before a grand jury. Valerie, the reporter, was writing a story about an up-and-coming environmentalist who suddenly disappeared and, she later discovered, whose backers purportedly have ties to a terrorist. When the seemingly ordinary assignment suddenly takes a shocking turn, Casey is forced to put aside her own feelings about the unexpected reappearance of a man from her past as she and two other Marshals take Valerie on the run. And as it becomes dangerously clear Valerie’s testimony has even bigger implications than they knew, they’ll do whatever it takes to make it out alive. 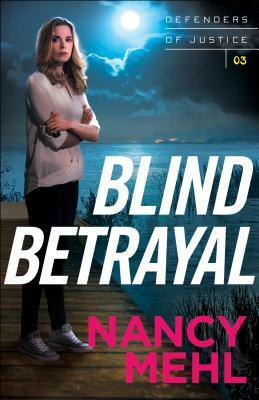 Blind Betrayal by Nancy Mehl is full of action, danger, and twists. I never expected the ending to end the way it did. There was a foreshadowing event for it…but I still did not see it coming. Nancy Mehl is a talented writer. The plot was fast-paced with threats coming in from everywhere. An enemy targets the Marshals’ office and blows it up. Causualities are found. Three agents are not sure how many they have lost or who is behind the attacks. Was the enemy really after them or their current witness in protection? Then, there was the past connection that both Marshal Casey and E.J. shared. Tension on both of their sides that turns out to more than what they expected. As for the bad guys, one of them finally gets caught only to turn on the bigger enemy. This enemy isn’t going down without a grand finale even if it means killing a family member…overall, there was tons of suspense and deadly hostile situations to enjoy. I loved how realistic this law enforcement operation was conducted in the novel. In the end, I highly recommend Blind Betrayal to readers everywhere. Nancy Mehl kept me guessing.